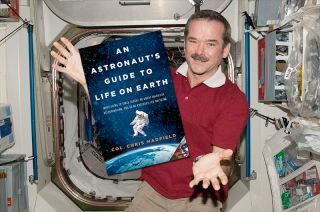 Astronaut Chris Hadfield, Canada's first commander of the International Space Station, visited SPACE.com's office this afternoon and you can watch the full video of our interview with him. SPACE.com's Managing Editor Tariq Malik and I asked Chris about his new book, "An Astronaut's Guide to Life on Earth" (Little, Brown and Company 2013), his amazing videos about life in space and what's next for him. He even played an impromptu song on the guitar for us, which you can see in the video below. Thanks to those of you who submitted your questions and tuned in to the webcast!